one and to the right for the other. These plants are vegetative kin. Please enlighten me if anyone knows about this oddity. or the other. But then who knows what happens at full moon! Let's have more of these intriguing observations! > one and to the right for the other. These plants are vegetative kin. > inflorescences on Cryptocoryne pontederifolia. > on a molecular level. > Please enlighten me if anyone knows about this oddity. be perhaps totally at random. molecular-level geometry. In normal life this is called "handedness." About "handedness" with aroids, Ted: when the spathe of Amorph titanum unwraps and opens it's easy to observe this, and all the ones that have flowered for me have been left handed, and all the ones at University of Wisconsin have been right handed. I don't know the reason for this, but it's interesting. Hemisphere? Tomorrow I'll forward a reference dealing with pole beans. > or the other. But then who knows what happens at full moon! > Let's have more of these intriguing observations! >> one and to the right for the other. These plants are vegetative kin. >> inflorescences on Cryptocoryne pontederifolia. >> on a molecular level. >> Please enlighten me if anyone knows about this oddity. It is presumably related to the direction of the phyllotactic spiral of the whole shoot. It is perhaps the same phenomenon as the scars on the trunks of Philodendron Sect. 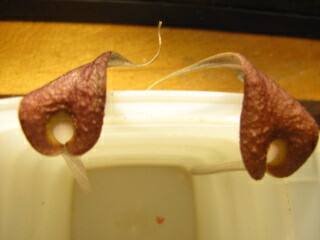 Meconostigma, which are shaped either like fat '6's or fat 'd's. > be perhaps totally at random. > molecular-level geometry. In normal life this is called "handedness." not something one might notice, even with two specimens side-by-side. think of any special advantage either; and yet they do it faithfully. > About "handedness" with aroids, Ted: when the spathe of Amorph titanum un wraps and opens it's easy to observe this, and all the ones that have flowe red for me have been left handed, and all the ones at University of Wiscons in have been right handed. I don't know the reason for this, but it's inter esting. I agree with Leland: Anth. wendlingeri is also my favorite aroid that spirals. When I had that plant prior to my move, I had many blooms, but I do not recall if the inflorescences all spiraled in the same direction or not. However, there was one bloom that started spiraling one way, then changed and spiralled the opposite direction! Add to this my second favorite group of plants (after the aroids): Utricularia, the bladderworts. I used to grow U. prehensilis. This terrestrial species sends out long stems from the soil surface that tend to stick out at close to 45 degrees from the horizon. Over the course of the day they slowly swing in an arc. I the encounter a stem of another plant or a plant tag they coil around it. Some stems will then slowly uncoil and swing back in the opposite direction, again until the encounter an object, and again, they coil around it. So, here is an example of a plant that will coil both directions on the same stem. > About "handedness" with aroids, Ted: when the spathe of Amorph titanum unwraps and opens it's easy to observe this, and all the ones that have flowered for me have been left handed, and all the ones at University of Wisconsin have been right handed. I don't know the reason for this, but it's interesting. Although I also like Anthurium wendlingeri for the spiraling infloresences, I collected an Anthurium sp. in Costa Rica back in 1992 that I have not yet sent photos to Tom Croat for i.d.ing, but the whole plant spirals as it grows, at least growing on smaller (2-3� diameter) tree trunks. It�s a wonderful species, with more roots growing up and out onto the leaves then grow attaching to the tree trunk host � one of the best non-bird�s nest examples of the trash-basket root system I�ve ever seen. The inflorescence and spathe are both green initially, the spadix slowly going slightly more yellow. The fruits are light orange as they pop out, and somewhat quadrangular at the base. The leaves are wide sword-shaped, to almost two feet long on short petioles � that�s the best I can do without going and looking again at the plant for more detail. I�m doubtful that it�s a new species, though wouldn�t that be neat � but I do plan on taking some detailed pictures and sending them on before long. In any case, a wonderful spiral. That Anthurium sound fascinating. I would enjoy seeing pictures sometime.